Beautifully engraved certificate from the Locke Steel Chain Company is unissued. This historic document was printed by Franklin Lee Division and has an ornate border around it with a vignette of a allegorical woman sitting next to a gear and tools. This item has printed signatures by the Company's Vice-President (Sylvanus Dyer Locke) and Secretary (F.S. McDaniel). 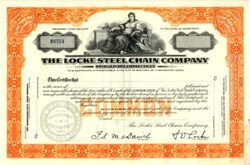 The Locke Steel Chain Co. was formed in 1895. S.D Locke had devised a new patented method of manufacturing link chain from steel strip rather than the standard method of casting. This was not only a major industrial innovation but was also considered a technical triumph. His son, S.D. Locke Jr., of Bridgeport, Conn., his successor, began design and prototype work in the early 1920�s on a self-propelled, self powered lawn mower. In 1928, after several years of development the Locke Power Lawn Mower was first offered for sale. It was an interesting second product for The Locke Steel Chain Company of Bridgeport, Connecticut. From 1898 until 1928 the only product offered had been a stamped steel detachable link agricultural chain. This chain displaced a more costly cast product and is still being made by Allied-Locke Industries Dixon IL. The innovative progressive die / press system was patented by Sylvanus Dyer Locke, Senior, (1833-1896) also know for his work in the development of a wire binder for grain. The chain was refined and finally brought into production by his son Sylvanus Dyer Locke, Junior, (1871-1959). As production began a Briggs & Stratton FI engine powered the Locke�s cast iron rear roller as well as the 25" counterbalanced cutting unit. Counterbalancing allows the cutting unit to "float" over the contour of the land. In addition there are no caster or side wheels to flatten the grass before it is cut. In 1930 the 70" Triplex model was added. Power from the engine was provided to the wing cutting units by way of a universal joint with "dog bones". This was innovative in that the usual practice was to use ground driven side cutting units. In 1933 the 30" Single and the 75" Triplex were added. An optional reversing gearbox was unveiled in 1949. Many people in the Northeast remember seeing this dark green mower on large estates, colleges, school, and ball fields. It is hard to forget the yellow pinstriping, the red doted lubrication points, the two wing cutting units, and of course the sulky. The Locke mower is currently being produced by Locke Turf Inc. in Opp Alabama.